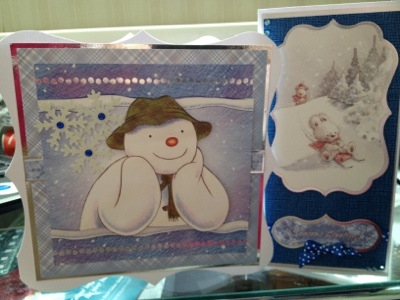 I have made 2 quick cards the snowman I had made into a decoupage it was 3 x 6x6 paper so I fixed 1 full sheet and the other two I cut down. I added some glittered snowflakes with 3 dark blue gems. The DL card is made with silver matt board and dark blue cordinations card then a topper and greeting from the mulberry wood from the hunkydory card pack and I added a dark blue spotty ribbon and light blue gems. These are fantastic Sam! I love them both with the cute images. Ideal Christmas designs, Sam. Loving the colours you have used in both.